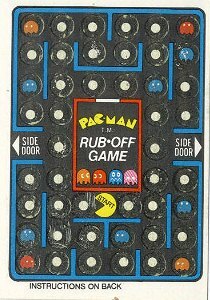 In addition to the three stickers, each pack of Pac-Man Stickers and Rub-Offs contained three rub-off games. Some of you may be wondering: What the heck is a rub-off game? Well, it's very similar to those "scratch off to see if you win a prize" contests. Using a coin or your fingernail, you scratch away the metallic surface to reveal something underneath. In this case, the "scratch away" spots are dots arranged in a maze. Starting at "START" you scratch off the dots, one at a time, following the maze as you go. You see how many dots, fruits, and blue monsters you can get before you uncover three colored ghosts. The second card above shows what it looks like with all of the dots rubbed off. 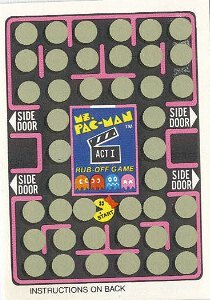 The pack wrapper indicated that there were 28 rub-off games you could collect. This doesn't quite make sense, because if you tried to figure out in advance which of 28 rub-off games you had, that would be cheating. But I suppose once you've played a lot of games and rubbed off all of the dots (including the ones you did not use during the game), you could start to collect them to see how many you had. 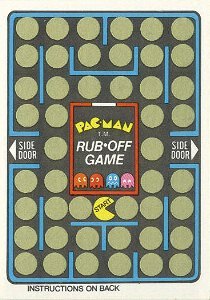 The rub-off games appear to be unchanged in the later versions (B, C, D) of the Pac-Man Stickers and Rub-offs packs, but Fleer came out with a whole new set of games with their Ms. Pac-Man Stickers and Ruboffs packs. These did for rub-off fans just what Ms. Pac-Man did for Pac-Man fans: Added four mazes and new variety, especially new tasty fruits. 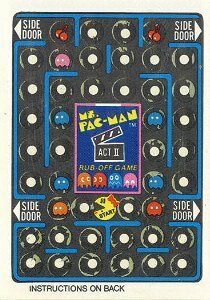 Then Fleer came out with Super Pac-Man ruboffs. By now you're probably ready to hit E-Bay and buy some rub-off games to start having some fun! But there's a serious problem. The games do not work anymore! Since the cards are now 20 years old, the metallic dots have somehow fused themselves to the surface of the cards, making them quite impossible to rub off. At least as far as I know! Try what you like: Fingernails, coins, knives, etc. -- you will end up destroying the image before you can see even a hint of what is behind the dot. Originally they worked just fine. I think part of it lies in the special formula that Fleer used. Most "scratch off" games use a soft silver coating. But Fleer used a tougher gold dot. This made the card more durable so it wouldn't accidentally be scratched off by sorting and packaging machines (I presume). So you had to scratch a little harder, but the dot rubbed off fine. I preferred my fingernail because it resulted in the least damage to the card. Anyway, over time the special formula got tougher and tougher. I remember scratching off games about five years after I originally got them, and they were a lot harder to scratch off. I had to use a knife. It worked, but it also scratched up the card quite a bit. By now it is apparently impossible, unless there is someone out there who has found a way to save us! I'm thinking it would need to be some kind of chemical that would "soften" the dots to make them usable again. If you have found a way, please let me know! Click on a link above for more details. The online rub-off game is on a different website and has been created by Paul Gutches.